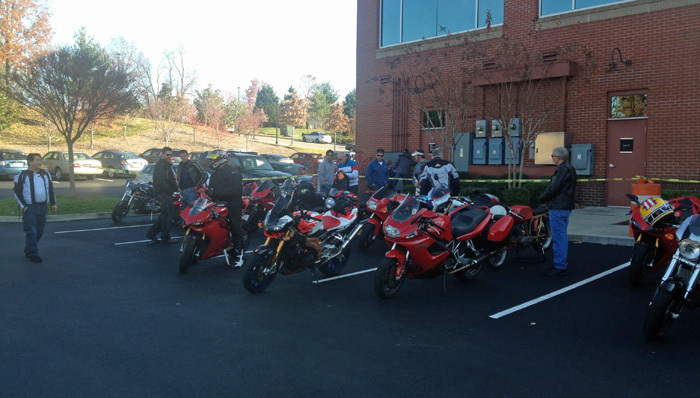 Cool Springs, TN, 15 miles south of Nashville, the Music City Ducati Riders got together with the local sports car club. I was late to the party as my Aprilia Tuono didn't have enough battery to start. So while the other guys ate a nice cooked breakfast, I munched on a bowl of Special K while my battery tender did its job. I had agreed to lead a ride and leave the cars and bikes meetup at 9:30am. I rolled into the parking lot at 9:20am. It was chilly, but the weather forecast had called for a quck warm up and mid day temperatues in the high 60's. There were about 20 exotic cars and about the same number of bikes. It seemed there were more folk mingling around the bikes. I snapped a few iPhone pictures, but they didn't come out very well with the low early morning sun and shadows. Of the 20+ bikes, only two decided to follow and go to a days long ride. We hooked up with two other guys on route bringing us up to a group of 5. I was pretty excited as one of the last two has an Aprlia Tuono V4, which is the bike I want next and the last time he came out, he offered to let me ride it, but we had such a big group, we split groups and he went off in another group. We did about 290 miles all told, most of the day I was chased by a Panigale S and a guy on a RC51. The roads were clean, a little damp in places where there were shadows from the trees. As we descended a small mountain switchback, I noticed the RC51 was now behind. We dropped down into a valley that had rock on our left side and a river on the right. He Yo-Yo'ed a little behind me, one moment he was 20 yards behind and the next about a football field back, after about 4 miles of watching this behaviour in my mirrors as I came into an area with trees on both sides of the road, figuring it would be completely wet and the pavement is not the best through that area, I decided to slow down, I glanced in my mirrors and he was not there and got that sinking feeling in my stomach. I dropped it down to about 20mph for about 15-20 seconds, no one came. I U turned and headed back, about a miles back, there was the other guys parked on the side of the road. They had the RC51 upright, but there was a lot of attention being given to it. The rider was on his feet, but was obviously in some pain. He had entered a rather difficult left hander, run wide, hit the Armco on the outer right edge of the road and then gone down hard on the left side. The fairing was rashed on the right side from the armco and the clutch, gear shift and left footpeg were gone. The left side exhaust and fairing were badly messed up. After about 5 minutes, the rider thought he could limp it home and tried to get going with a push and bump start without a clutch. We could hear a lot of clicking in the gearbox, but it wouldn't engage a gear, which is probably a good thing. After two failed attempts, he got off his bike and said he felt nauceous and sat down for 10 minutes. He called his brother and arrranged for him to come (90 miles) to pick him up in his truck. Probably a good thing as we later found out he broke his collarbone in 3 places. This all happened about 3 miles from where I was going to test ride the Aprilia Tuono V4 for about 20 miles, so I didn't get a go on that again. Sunday called for even better weather than Saturday, but I figured I woild be doing Honey Do stuff all day. My wife had a work friend come in from England and Saturday evening she mentioned that she was hooking up with two other women, so I asked her if this was a women's day she said it was gave me a hall pass. My buddy Jim had asked me to go to a ride, so that's what we did, well about 400 miles all over the left side of Tennessee.